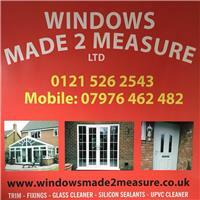 Windows Made 2 Measure - Windows/Doors/Conservatories based in Wednesbury, West Midlands. Windows Made 2 Measure Ltd is an established local business with over 30 years experience in the manufacturing and installation of Windows, Doors, Porches, Conservatories, Aluminium Bi-Folding Doors and Sky-pods / Lanterns. We pride ourselves on being able to offer an all encompassing service by manufacturing our own products in our own factory making our costs highly competitive. Our installations are covered by our 10 year guarantee. Windows Made 2 Measure Ltd also offer a replacement service for Double Glazed Units, Windows and Doors. We take great pride in our excellent standard of workmanship, friendly approach and customer first attitude. Call us now for your free no obligation quote. It could be the best decision you make today.